Supermarket chain Iceland has adopted the world’s first plastic-free trust mark, launched yesterday (17 May), to help consumers make more environmentally-conscious purchasing decisions. The concept of the ‘Plastic Free’ mark, developed by campaign group A Plastic Planet, is simple: it will be borne by items free of plastic, which the group believes will lead to a significant reduction in the consumption of single-use plastic packaging food and drinks. The issue of plastic waste has been catapulted to the forefront of the public consciousness in recent times, with government taking heed of the increasing concern regarding the material’s impact on the environment and committing to eliminate ‘avoidable’ plastic waste by 2042 in its 25 Year Environment Plan. Consultations on the introduction of a ‘plastics tax’ and a deposit return scheme for beverage containers have also been launched in recent months. Iceland will now see the trust mark adorn its own-brand eggs, cottage pie and vegetable burgers, with a view to rolling the label out to soft fruit, mushrooms and potatoes by the summer. The supermarket hopes to reduce plastic usage by over 600 tonnes per year, with a wider goal of eliminating single-use plastic packaging in all of its own-brand products by 2023, replacing it with carton board, wood pulp, glass metal and compostable materials. 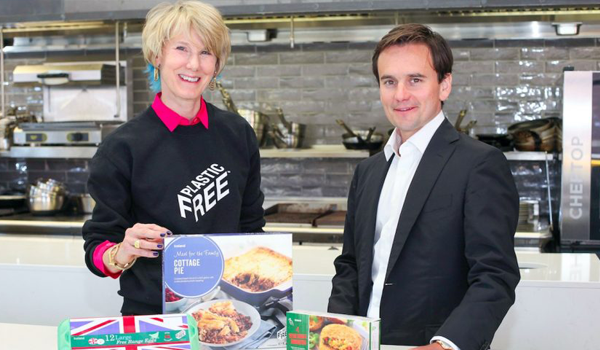 Commenting on the announcement, A Plastic Planet co-founder Sian Sutherland said: “Now we all know the damage our addiction to plastic has caused, we want to do the right thing and buy plastic-free. But it is harder than you think and a clear no-nonsense label is much needed. Other retailers have made similar pledges to Iceland’s in recent months, with the UK Plastics Pact, launched on 26 April, seeing 42 businesses commit to eliminating ‘unnecessary’ single-use plastic packaging by 2025 and making 100 per cent of plastic packaging reusable, recyclable or compostable. In terms of individual retailers, Waitrose has committed to phasing out black plastic trays in its stores, while Tesco has said it will make all packaging recyclable or compostable by 2025. The Co-op, meanwhile, has committed to making all of its own-brand products 100 per cent recyclable, with an interim target of 80 per cent of its products being recyclable by 2020.